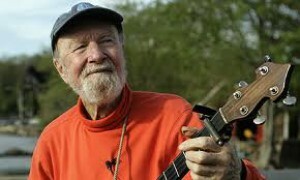 With the recent passing of folksinger and activist Pete Seeger, the world has lost one of its most passionate Green Voices. Pete, who died on January 27 at the age of 94, spent his life working, marching, speaking and singing for the environment, social justice, peace, and other causes about which he cared deeply. As a solo performer and as a member of The Almanac Singers and The Weavers, Pete occupied an international stage. He knew the power of that stage, and used it to advocate tirelessly on the big, global issues that concerned him. But Pete also knew the power of local action and advocacy, and he used that knowledge to make a real difference in his home place, New York’s Hudson River Valley. He showed all of us what’s possible when you’re passionate and committed and you roll up your sleeves. Pete’s enduring lesson: each of us has the potential to save the places we care about. In the late 1960s, Pete’s beloved Hudson was a polluted mess, fouled by oil, raw sewage, and toxic PCBs. Living along its banks in Beacon, NY, Pete was concerned. But he didn’t just wring his hands. He got to work, recruiting like-minded people to “build a boat to save the river.” That boat, the 106-foot sloop Clearwater, was christened with Hudson River water in 1969. As they sailed and sang and organized, Pete and the Clearwater crew built a movement, one person at a time, of people who cared about clean water. In 1972, he sailed the boat he had built down to Washington, D.C., where he performed an impromptu concert and delivered thousands of signatures to members of Congress, urging them to enact the Clean Water Act. They did, and Americans have benefited for four decades from the provisions of that groundbreaking law, which prohibits the discharge of pollutants into navigable waters. Each of us can make a difference! Forty-five years later, the Hudson is cleaner, and a nonprofit organization, Hudson River Sloop Clearwater, Inc., carries on Pete’s work, sailing Clearwater up and down the river, a floating environmental classroom bringing people together in song and advocacy. On the banks of the once dirty stream Pete sang about, his dream that the Hudson would once again run clear is closer to reality. As principal of Your Green Voice, I write about environmental issues for a living. I have been struck repeatedly by the powerful stories of people who, like Pete, are passionate about their little corner of the planet. People who, like Pete, are doing their part to leave our world a better place. They’re teachers, students, farmers, musicians, entrepreneurs and activists. I look forward to sharing their stories with you in this new blog, hoping you’ll be inspired too.